Ecurie Ecosse drivers Oliver Bryant and Andrew Smith visited the Ragus HQ today to outline the teams exciting plans for 2014. More to be announced in the coming weeks. Oliver Bryant, Ben Eastick & Andrew Smith. Jana Pettersson, Ranzie Anthony, Ben Eastick, Peter McNeil, Victor Woode. If you’ve already found your way here, then you’ve probably gathered that our website is sporting a fresh new look. We unveiled it just before Christmas as part of a revamp of our entire online presence. It showcases the four pillars of our business – sourcing, manufacturing, consulting and delivering – along with telling the story of our heritage in sugar. The site features a series of videos explaining our history and Ragus today. 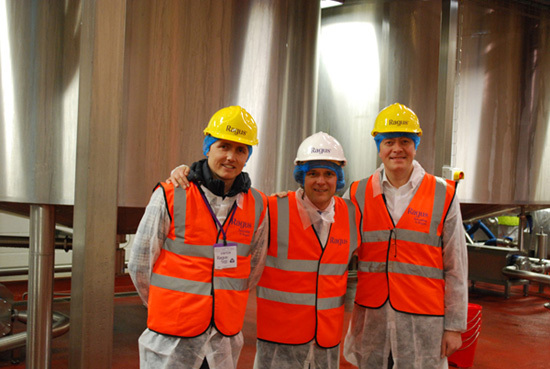 We’ve also included a film from inside our new factory – the first time that a UK sugar manufacturer has provided such a detailed behind the scenes look at its operations. We’ve also added a responsibility area. This shows how we support the communities in which we operate, while our learning zone explores the journey that cane makes from the field to production. The website is a completely open and honest presentation of our business and is the first step in modernising our online communications. I’m sure you’ll agree that this new site better tells the story of a successful UK manufacturing business with the size, scale and capabilities to compete on a global stage. We worked with web experts Athlon on the new site, who have also re skinned our YouTube channel (which you can view here) to create a seamless online presence for us and to tell the world about our latest news and activities. You are currently browsing the Ragus blog archives for January, 2014.